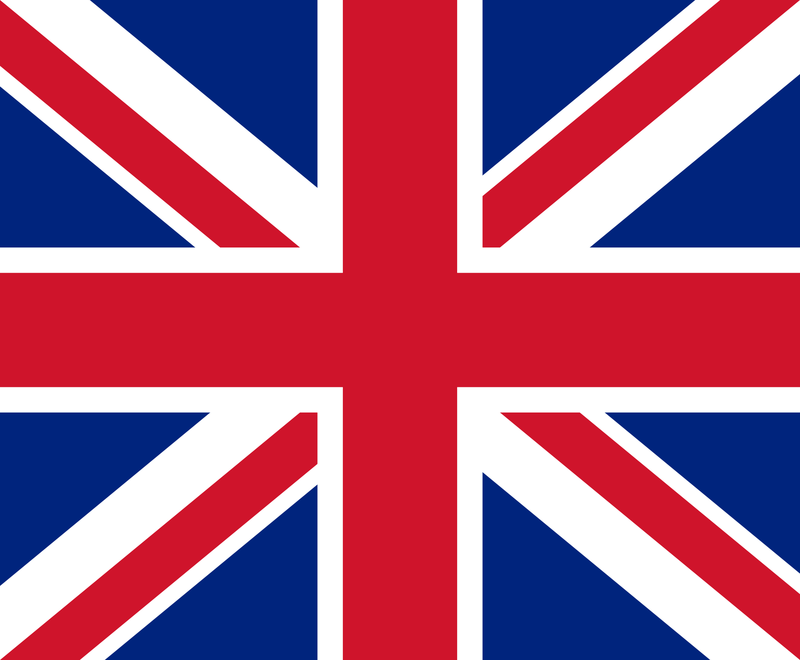 This is a private and self-drive tour. It will be organized for you only, so you will not be part of a larger group. Your Christmas Holiday Tour in Romania will start in one of the “last truly rural places of Europe”: the region of Maramures. It is a place where unique traditions are still kept as centuries ago and Christmas time is one of the richest periods when you can witness them. Depending on your arrival time you can start exploring the village where you will stay or you can enjoy a relaxing evening at the charming rural guesthouse which will be your home for the next five days. It’s time to hit the road to discover Maramures region! You will start with a visit to probably the only happy cemetery in the world called the Merry Cemetery. 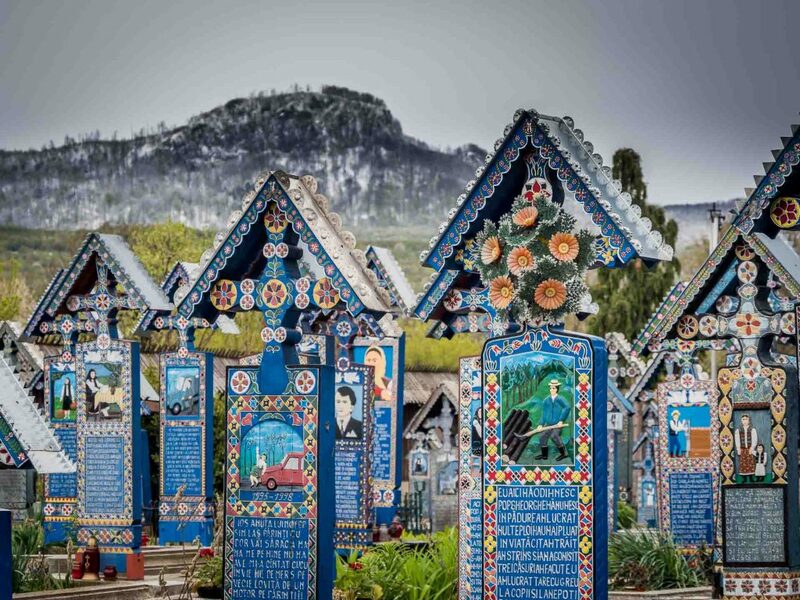 Its crosses are decorated with lively colors and some funny poems about the life of the deceased. Then you will travel to Sighetu Marmatiei where you will learn about the communist time and its impact on our country at the Memorial of the Victims of Communism. You had some time to get used to Maramures so it’s time to start acting like one of the locals! 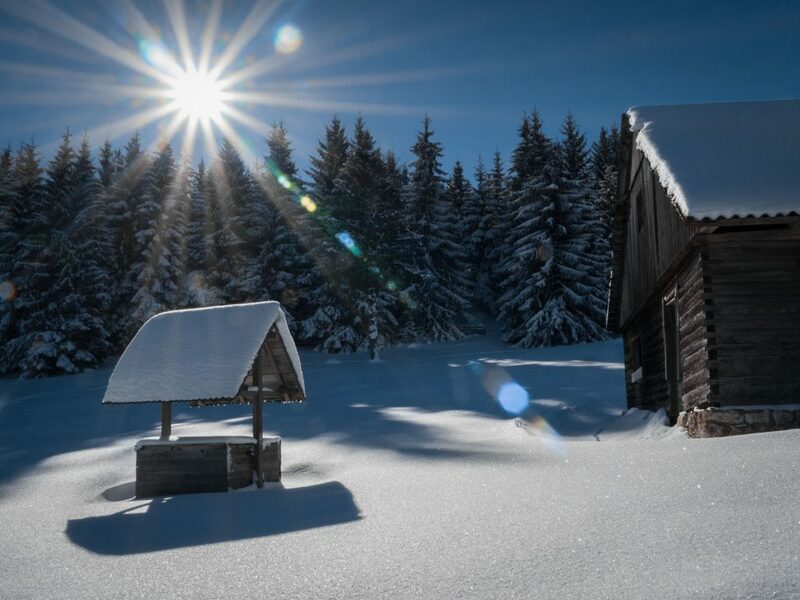 In the first part of the day you will enjoy a horse-sledge ride through the village and countryside. Then, as every “maramuresean” does on Christmas Eve, you will prepare to greet the carolers wandering from house to house dressed in traditional clothes. Caroling or “colindat” in Romania is a very rich tradition and its uniqueness was recently acknowledged when it listed as part of the UNESCO intangible world heritage. And Maramures is the best region to experience this fascinating custom. On Christmas Day you will delight yourself with a traditional festive lunch prepared by your hosts. 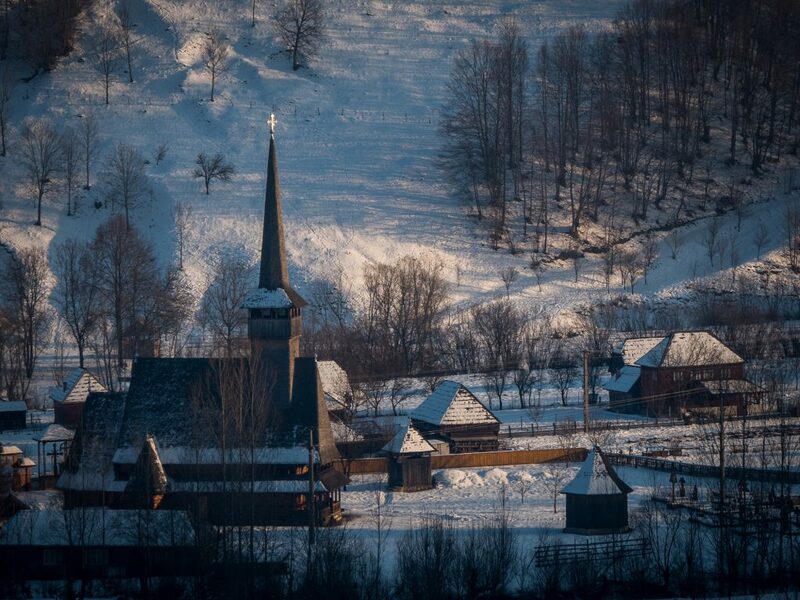 Then you will find out why Maramures is called “the land of the wooden churches”. You will visit some of the beautiful small churches, made entirely of wood, which are specific to the region. Their uniqueness is internationally appreciated and some of them are part of UNESCO’s World Heritage Sites. Today you will be introduced to the beautiful nature of the Carpathian Mountains. 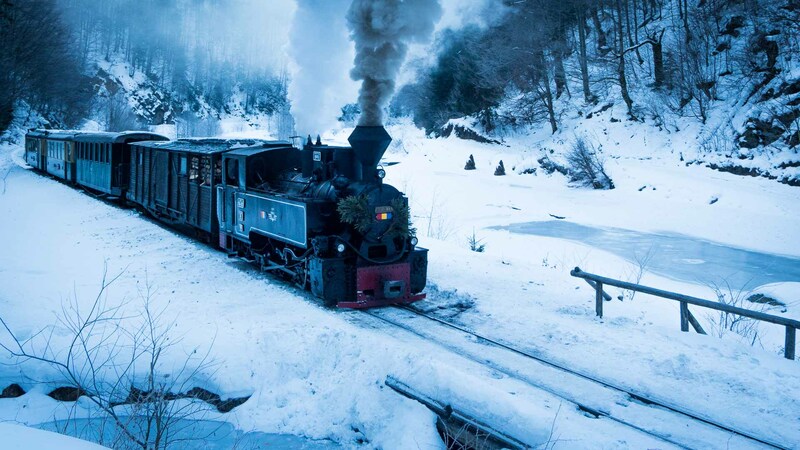 You will have a ride with the only narrow-gauge steam train in Europe which is still functional today. The train takes you to spectacular landscapes of mountains and valleys and when you are up in the mountains you will enjoy a meal there before returning on the same very scenic valley. In the nearby town of Sighetu-Marmatiei the end of each year is marked by celebrations of the traditional local customs which have emerged into an appreciated festival. In the first part on the day you will take part in a festival where people from villages all around Maramures gather to celebrate together and to display their unique Christmas customs. Then you will leave Maramures behind and head to the much more famous Transylvania region. You will arrive in Sovata where you will stay at a hotel with a spa so you will enjoy a sauna, Jacuzzi and pools. I hope you like a little adrenaline as today you will experience a sledge ride, pulled by Husky dogs. Depending on how much you are used to handle the cold, you could go for an uninterrupted 1 hour-ride or for shorter turns between which you can warm up. If there is not enough snow to do the sledge-ride we can plan a wheel-cart ride or other activities instead. Back at the hotel you will be able to enjoy again the spa. You will leave Sovata early morning and head towards Sibiu, a charming town exuding a bohemian atmosphere where you will spend the next days of your Christmas and New Year’s holidays in Romania. On the way you will stop in Sighisoara, a UNESCO World Heritage site and one of the best preserved medieval citadels in Europe. Walk along the cobbled streets to feel the atmosphere of old times and admire the views from the top of the historic Clock Tower. Next on your journey is Biertan, a place of Transylvanian Saxon heritage where you will visit the fortified church, an imposing monument that overlooks the entire village and valley. Today you will enjoy a day trip and travel east towards the neighboring counties of Hunedoara and Alba. 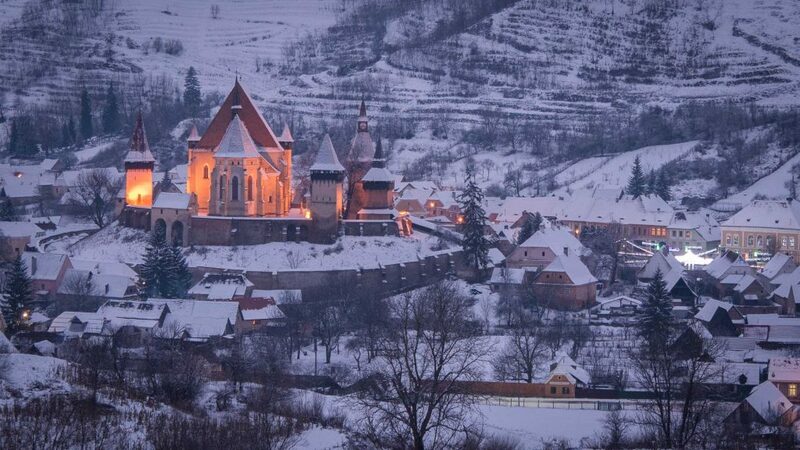 Hunedoara is home to Romania’s most important Gothic architectural monument, Corvin Castle. Don’t hesitate to cross the long entrance bridge and find out the various legends of the place. Alba Iulia, a city of historical importance is a must-see attraction. Spend a few hours in the place where the three main regions united to form the present Romania and explore the fortress, after which you will travel back to Sibiu. This day will be fully dedicated to discovering Sibiu and its captivating attractions. You can stroll through the Old Town to admire the colorfully painted houses and find out the stories behind their walls, visit Romania’s oldest museum or take in the picturesque views from one of the tall towers. 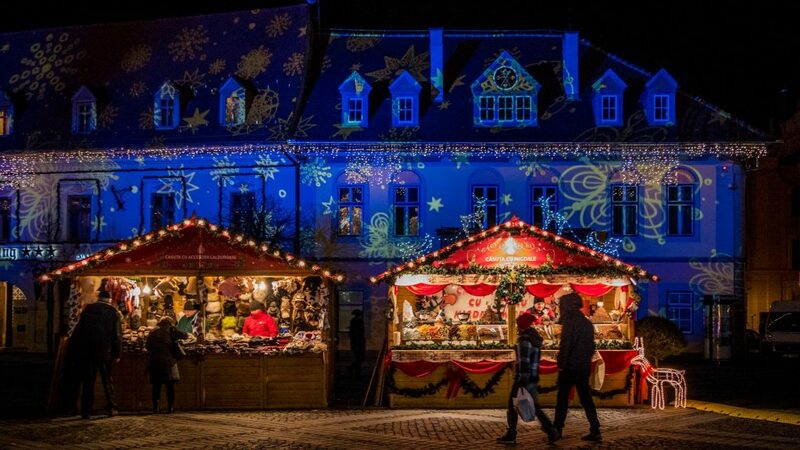 Sibiu is also famous for having the best Christmas Market in Romania, so leave aside a few hours for enjoying the festive atmosphere. At night you can gather in one of Sibiu’s many squares and count down to the New Year. Welcome 2019 with fireworks, good food and music. As most shops and attractions are closed on the first day of the year you can choose to spend the day relaxing or walking along the beautiful streets of the town. If you wish for a more active day you can travel to Paltinis, a famous area amongst sport lovers where you can ski or ride a bobsled or just have a walk in nature. It’s now time for one of the highlights of your time in Romania – spending a night in an ice hotel. You will drive from Sibiu towards the Fagaras Mountains and then take a cable car up to Balea Lake, where the ice hotel is built every year. 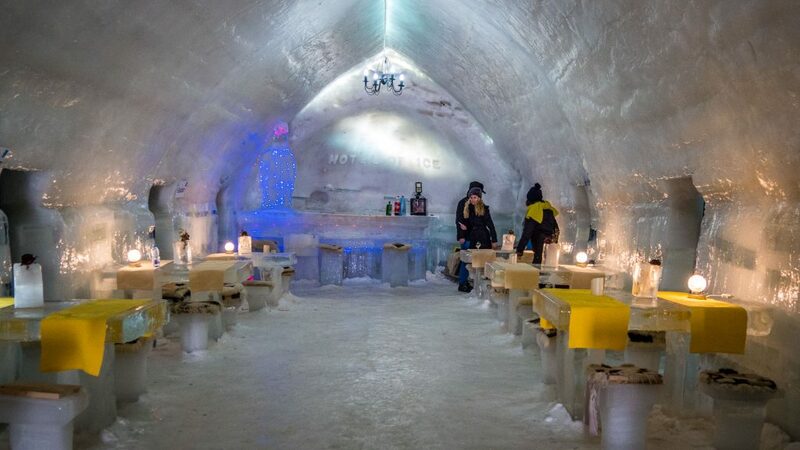 The hotel has everything one would expect from such a place: rooms or igloos decorated with furniture made entirely of ice, soft blankets that will keep you warm at night, an ice restaurant and even a park where you can have fun and enjoy winter sports. In the morning you will say farewell to your ice room, descend the mountain and head to Brasov, a medieval city surrounded by the Carpathian Mountains. On the way there you may stop in the village of Prejmer, home to the largest fortified church in Transylvania. In Brasov you can walk around the old town, admire the defensive walls and towers. Not to be missed are the views from the nearby Tampa Mountain, where you can arrive by hiking or taking the cable car. In the morning you will go to Zarnesti to visit the Libearty Bear Sanctuary, a place where formerly captive bears are now kept in safe conditions. You’ll be able to observe them in their natural habitat and find out their moving stories. 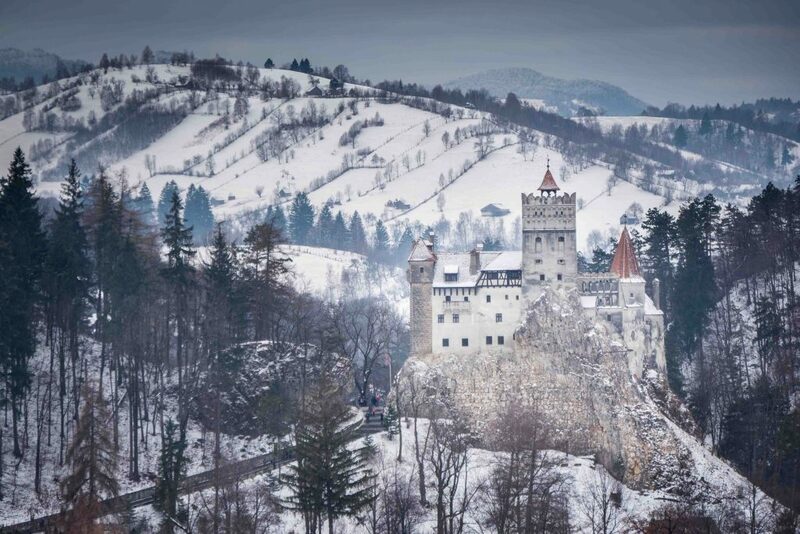 Next on your itinerary is Bran Castle, famous for its association with Dracula. Built in the 15th century, the imposing monument manages to bring to life the long-forgotten atmosphere of medieval times. 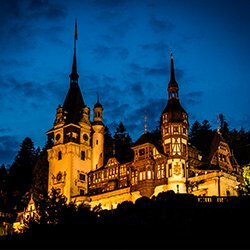 On the last day of your Christmas holidays in Romania you will leave Brasov and travel to Bucharest, from where you will take a flight back home. We designed this Christmas tour to start from Maramures (Cluj Napoca airport is the closest) and to end in Bucharest but we can adapt the tour to other places of arrival and departure as well. Rented car to be used on the above itinerary: 4x4 car for up to 4 people (Dacia Duster or similar) and minivan for 5-8 people (Renault Trafic, VW Caravelle or similar). Cars usually have manual transmission but if you want to to drive automatic, please let us know. The prices are calculated for a self-drive private tour for groups of the sizes mentioned below. If you are interested in a guided tour, please send an inquiry for the prices.